In a 5,000 year old grave outside Falköping, scientists have found the oldest traces of the plague bacterium's DNA in the world. An international research team including archaeologists from the University of Gothenburg made the discovery using advanced DNA techniques. According to the researchers, this discovery may also have identified the first pandemic in history which stretched from Europe across to Asia as a result of the new trade routes in this period. The remarkable finds were made at Frälsegården in Gökhem outside Falköping in a passage grave – a kind of collective grave with a large stone burial chamber. 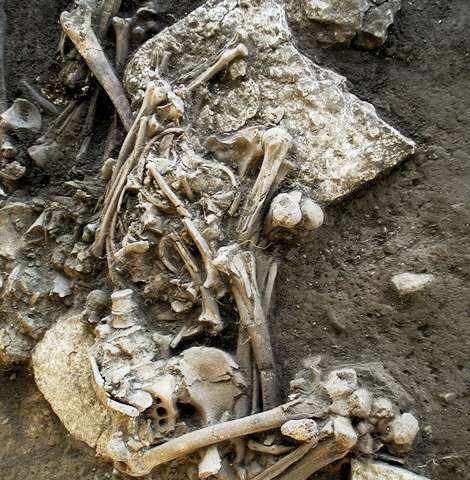 Traces of the DNA of Yersinia pestis, the bacterium that causes the plague, were found in the skeletons of Middle Neolithic farmers who have lived at the site approximately 4,900 years ago. The bacterium, which started the Black Death for example, is the deadliest in human history and has cost millions of people their lives. The discovery was made by a multidisciplinary research team from France, Denmark and Sweden that includes archaeologists Kristian Kristiansen and Karl-Göran Sjögren from the University of Gothenburg. "The discovery of such an early variant of the bacterium in Falköping was totally unexpected since previous findings pointed to Yersinia pestis as having originated in Asia. This now needs to be re-evaluated, so it certainly is a significant discovery," says Karl-Göran Sjögren. The find in Falköping also means that the researchers may have solved another mystery. It was only recently discovered that people in different regions of Eurasia were all infected with the plague during the Bronze Age. But where and when the disease first appeared and how it spread has been unknown – until now. The variant of the bacterium discovered in Falköping seems to have given rise to all subsequent variants and is believed to have spread rapidly since the bacterium has been discovered in finds dating from just a few hundred years later across a huge area from Eastern Europe to Central Asia. "We think now that the first plague may have occurred in the Cucuteni–Trypillia culture north of the Black Sea a few hundred years before the find in Falköping and then spread to both the west and the east, changing along the way. Its spread may have been facilitated by better communications such as ox-wagons, which were then starting to be used," says Karl-Göran Sjögren. It was by analysing 'molecular clock' data that the researchers discovered that different strains of the plague bacterium spread very rapidly in Eurasia between 5,000 and 6,000 years ago. This matches exactly a period in South-East Europe when the first large population densities arose but also collapsed. It was also at this time that many technological breakthroughs occurred such as the wheel, the use of draught animals, and metallurgy – breakthroughs that facilitated long-distance trade, for example. "This very rapid spread is indicative of well-developed communications and contacts that linked groups across very large areas," says Karl-Göran Sjögren. Based on this evidence, the researchers therefore believe that it really was a pandemic of the plague that occurred in those large population densities which subsequently had major consequences for future civilisations and migration patterns.